In the most intense scene in “Changing of the Guard,” TNT’s first “Dallas” episode, Christopher angrily accuses Elena of exposing flaws in his methane hydrate project. She fires back by calling him out for dumping her – via e-mail! – on the day they were supposed to be married. So begins one of the biggest mysteries of the new “Dallas’s” first season: Who sent the e-mail that broke up Christopher and Elena? The storyline produces more than a few twists, and as the Dallas Redone blog noted in June, it also evokes memories of another pair of star-crossed Southfork lovers who were kept apart by counterfeit correspondence. During the classic “Dallas’s” seventh season, baby Christopher’s newly separated parents, Bobby and Pam, were on the verge of reconciling when they encountered interference from another relative: Pam’s conniving half-sister Katherine, who forged a letter in which Pam told her lawyer she no longer wanted to be married to Bobby but would return to Southfork to avoid hurting him. Katherine, hoping to snare her sister’s husband for herself, showed Bobby the letter, knowing it would prompt him to give Pam the divorce he believe she wanted. The ploy worked and Bobby and Pam were kept apart. In “Hush, Hush, Sweet Jessie,” the penultimate episode of “Dallas’s” seventh season, the truth finally came out. In a quiet, moving performance from Victoria Principal, Pam pours out her heart and tells her ex-husband she never wanted to end their marriage. The revelation confuses Bobby, who reminds Pam what she had written in the letter to her lawyer. The conversation is interrupted by a ringing telephone – symbolic, perhaps, of the bells going off in Pam’s mind. At the end of the episode, she confronts Katherine (played to wicked perfection by Morgan Brittany), who brazenly confesses to her forgery – prompting Pam to smack her so hard, Katherine falls onto a nearby bed. Flash forward three decades: In “Truth and Consequences,” TNT’s fifth “Dallas” episode, after Christopher pulls Rebecca aside at the Ewing barbecue, she tells him Tommy sent the e-mail that broke up him and Elena – which leads to Christopher striking Tommy in front of the other guests. Like Pam’s smackdown, Christopher’s punch offered a satisfying flash of catharsis for viewers who knew Tommy was secretly plotting against the Ewings. It also reminded us: The Ewing men may have a lot in common with their daddies, but sometimes they take after their mamas. In “Hush, Hush, Sweet Jessie,” a seventh-season “Dallas” episode, Pam (Victoria Principal) stands at a window in her living room while Bobby (Patrick Duffy) rests on the arm of a sofa. PAM: I laid awake most of the night, just thinking. Thinking about how sad everything is. There have been so many tragedies in the past couple of years. Mama’s dying. Now Mark’s dying. Our marriage breaking up. Sometimes I just can’t believe that we’re divorced. I don’t know, Bobby. We should have found some way to have made it work. BOBBY: I don’t disagree with that. PAM: I thought a lot about our splitting up. It wasn’t just your fault or the Ewings’ fault. A lot of it was my fault too. You don’t know this, but I came to Thanksgiving Square that day to tell you that I was ready to try again. BOBBY: Try? Try what, getting back together? BOBBY: Well, that’s very strange. I was sure you didn’t want to. PAM: Oh, Bobby, I wanted to. I always wanted to. I just didn’t know if I could. [Walks toward him, they sit together on the sofa] Anyway, before I could say anything, you told me that you were letting me go. BOBBY: But that’s because of your letter. BOBBY: The letter that you wrote to your lawyer. Maybe it was a first draft or something. Maybe you didn’t even send it. But Katherine found it and read it to me. It wasn’t the easiest thing I ever listened to. PAM: Do you remember what was in it? BOBBY: You said you wanted out of the marriage. You didn’t want to divorce me. You were afraid it would hurt me. You were hoping that I’d let you go. In the background, a telephone rings. PAM: Katherine read you this letter? BOBBY: Yes. And despite how I felt at the time, it made me realize you wanted a different life. 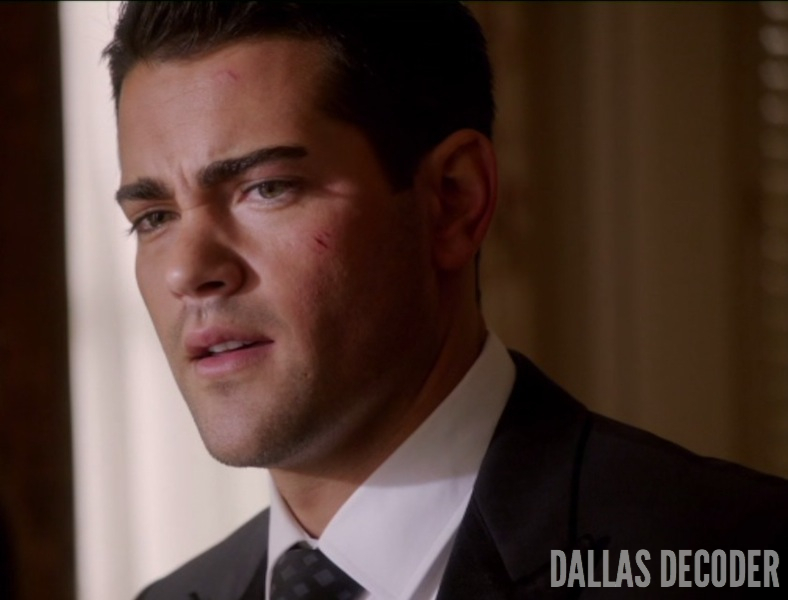 In “Changing of the Guard,” the first episode of TNT’s “Dallas,” Christopher (Jesse Metcalfe) angrily leads Elena (Jordana Brewster) into a room at Southfork and slams the door behind them. CHRISTOPHER: You couldn’t wait to tell him. CHRISTOPHER: About the methane. The earthquake. Everything I told you in confidence, you told John Ross! ELENA: I don’t know what you’re talking about. CHRISTOPHER: [Grips her arms] Don’t lie to me! ELENA: [Pushes him away] Let go. CHRISTOPHER: Don’t lie to me! ELENA: I have no idea what you’re talking about. CHRISTOPHER: John Ross tried to blackmail me. He said he was going to tell my father everything. ELENA: I didn’t tell him anything. CHRISTOPHER: And what you did? What you did was for nothing. Because he doesn’t love you. He uses people. And you want to know what’s really sick? I trusted you again. ELENA: [Slaps him] John Ross doesn’t love anyone but himself? You look in the mirror, Christopher. You listen to your own words. I will always love you. [Crying] But we are two different people, from two different circumstances. I hope you understand. Was I really so wrong for you? CHRISTOPHER: I have no idea what you’re talking about. ELENA: The e-mail you sent me. The day we were supposed to get married. CHRISTOPHER: I never sent you an e-mail! I waited for you. For six hours! I thought you were dead, Elena. [Crying] I was calling hospitals. I called Southfork. And when I finally got together with my father, he said you were in Mexico. And the next time I saw you, you had hooked up with John Ross! So what was I supposed to think? ELENA: You sent me an e-mail saying that we were a mistake. Ross found me. I thought I wasn’t good enough. CHRISTOPHER: No. [Touches her face] No. Don’t ever say that. My goodness, if I were Pam that phone would have rang off the hook. The whole issue of the letter really needed to be settled between Bobby and Pam at that moment. Both the letter and the future email plots unfortunately had me doing eye-rolls. I can understand the immediate feeling of pain and heartbreak, but those were VERY important issues that needed to be squared out in person. Not just taken at face value like that. Great Post and comparisons! I really like this addition to the blog. I agree: Divorces, broken engagements — this is important stuff! Do you suppose one day we’ll be rolling our eyes at “Dallas” characters whose relationships are sabotaged via counterfeit text messages? Thanks for commenting, Lady G. I’m glad you like this new feature. I hope to write about a few more “‘Dallas’ Parallels” in the coming weeks. Thanks! I wouldn’t be surprise if someone on Dallas got a bad Text message that led them into a trap! LOL. A Marta/Julie Grey parallel would be great, and an Anne/Miss Ellie. Though you have touched on those pairs in earlier critiques. Thanks for reading Lady G.
Of course, Katherine’s letter was much more sophisticated than the email that broke up Christopher and Elena. Because Katherine’s stratagem actually made it impossible for Bobby and Pam to talk about the issue properly. Bobby could not very well admit that he had listened to Katherine reading him Pam’s correspondence, and talking about Pam’s view of her marriage – as indicated by the letter – would have beaten his purpose of giving up on the marriage in order to make her happy. Even if they HAD talked, the letter would have prepared Bobby for Pam telling him that she wants to come back to him, but he wouldn’t have believed her. So both Bobby and Pam were led to think that the only way for the other to be free and happy would be a divorce. 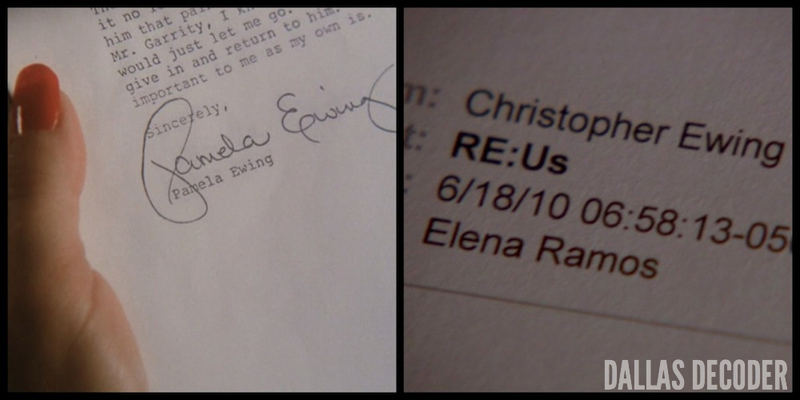 The effect of the email, however, depends on Elena and Christopher not speaking to each other at all. Their separation could have been avoided more easily. Unless Rebecca and Tommy knew Christopher and Elena’s characters well enough to be certain that they would react in this immature way, they were lucky that their stratagem worked. You make several good points, Stephan. The plotting in the original show’s storyline was pretty clever. Katherine was quite the evil genius, wasn’t she? Wow, Stephan, I had to read that over 3 times. LOL. Katherine is a twisted bird, isn’t she? Great observations. Now that we know Rebecca is really Cliff’s daughter, then she has more insight into Christopher’s attitude and character I would think. Plus Tommy said they spent 2 years working on this long con. So they had time to spy and observe. Dallas Decoder is without a doubt one of the most thorough sources of Dallas information, both past and present, on the Internet. A must for diehard fans. Thanks for the mention. Hey, thanks a lot. I appreciate this. You do a terrific job with your site. I enjoy reading it. Keep up the great work. The email is really a poorly written imitation of Katherine’s letter. There’s a major difference in the two. The people around Pam and Bobby made sure communication between them was as difficult as possible. Mark, Cliff, Katherine all were trying to block Pam from getting back with Bobby while JR and Katherine were doing the same with Bobby. With Elena and Christopher, there were people around them who had their best interests at heart (there was no Rebecca there to intercede) so it looks like Bobby, Ann, and Carmen made no effort at all to find out why their marriage was suddenly halted and it appeared both Elena and Christopher acted the same bratty way, by telling no one what had happened. It makes no sense. I think both scenarios stretch credibility, but you’re right that the e-mail is the weaker of the two plot devices. Thanks for commenting, Archie. I always appreciate your point of view. This fake correspondence is terrible. I can remember when fake correspondence got that fine Texan Dan Rather of CBS in trouble over George W. Bush’s war/national guard service & the Ewings (whose original network was CBS) would have given Dan hell over his falser “60 Minutes” report that cost him his job. He wrote letters & emails to his CBS sources infering that George W. hadn’t served his full National Guard duty & gave out fake correspondences from those sources that Bush 43 wasn’t a true veteran. When in fact he hadn’t checked his paper trail sources properly & later learned that Bush 43 had in fact served 11 days over his required term of service in the National Guard. These fake letters & emails cost Dan the CBS Evening News after 24 yeras, 1 year short of the 25 he wanted to serve & CBS was fully justified in knifing Dan out, Ewing style! I was a big Dan Rather fan growing up and was saddened by all that business in 2004 and 2005. Poor Texans and their fake correspondence; it trips them up every time.